Ex-England striker Cyrille Regis fears an anti-racism social media campaign inspired by Barcelona's Dani Alves may detract from the issue's seriousness. Players posted pictures of themselves eating bananas in support of defender Alves, who had picked up one thrown by a Villarreal fan and taken a bite. Regis, who suffered racist abuse in the 1970s and 80s, said: "You don't want it to detract from the severity of the racist insult it was intended it to be. The former West Bromwich Albion and Coventry striker, 56, who was capped five times by England, added on BBC Radio 5 live: "The social media campaign does seem to help because it takes the sting out of it. It has that diffusing effect. "But we shouldn't get away from the fact that this person was being racist and trying to run down Alves. "Social media has a life of its own, a thing like that can have a life of its own." Regis added the action itself, which occurred during Barcelona's 3-2 win at Villarreal as Alves prepared to take a corner, was not new. "He's done something that the players in the past have done before," said Regis. "He took the sting out of the gesture, but we shouldn't take away the seriousness of that situation." Regis reflected on the abuse he and fellow black players suffered with West Bromwich Albion. "Back then, we had 10,000 people shouting racist abuse at us," he said. "I remember one time Brendan Batson picked up a banana and pretended to eat it. "Back then, no-one knew how to deal with that kind of racism but I think we've come a long, long way now." He added clubs and football authorities in Spain could learn from English football's example in helping to tackle racism in the game. 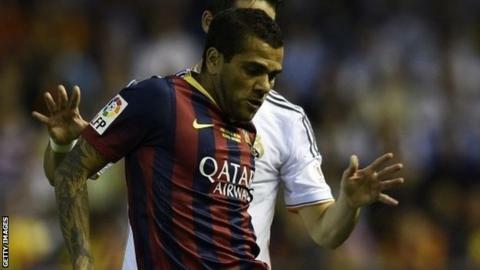 Alves has called for the fan responsible - since identified and banned by Villarreal - to be publicly shamed. However, Regis added: "He's been found, he's been banned, which is great. What's good as well is that other fans around the place found it in poor taste and outed him. I think he's got his just rewards. "Football clubs can't have the responsibility for personal actions."